A flashback begins the episode, with a young Yui creating a “White Christmas” for Ui by putting pillow stuffing on a tree outside their home. Meanwhile at school, Ritsu announces her intentions to throw a Christmas party, and it’s decided to have it at Yui’s home. The girls, joined by Nodoka, go shopping for a gift exchange, while Ui prepares a feast. The party starts, and the group is also joined by the always-outrageous Sawako before the gift exchange happens. That’s followed by a talent show. The episode ends with the club getting together for hatsumode. 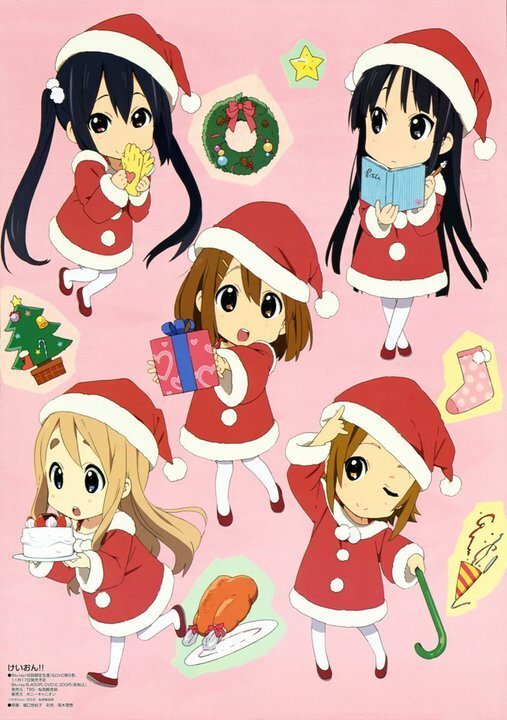 In addition to a joyful tone, K-On’s Christmas episode is filled with holiday music, Christmas tree decorating, and general merriment. Celebrating with friends and family, of course. What else would you expect from K-On? The focus of this episode is on the sisterly relationship between Yui and Ui, and the simple joys of enjoying the holiday. The O’Henry-esque gift exchange between the sisters (without the Gift of the Magi irony) is a nice touch. And Mio’s reactions are adorable – she remains my favorite character in K-On! This episode is too cute…I gave up one episode into season two because I just kept falling asleep when watching, but I’m reminded of how charming this show can be and why it’s so popular. One thing’s for sure – the boys of October are long gone. Baseballs and softballs don’t mesh well with Christmas anyway. Yea, this was a perfectly cute and charming moment. I loved it! A very cute episode in a series full of cute.